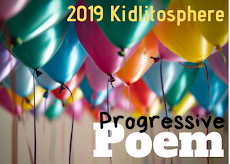 TeacherDance: #SOL16 - 11/31 - And Poetry Friday - Spring? 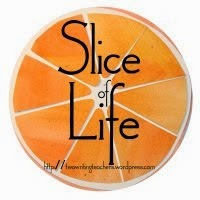 I'm slicing with the Two Writing Teachers community for Day Eleven of Thirty-One of the Slice of Life Challenge in March. Thank you Stacey, Tara, Anna, Betsy, Dana, Kathleen, Beth, and Deb. And today it's time to gather for Poetry Friday. Visit our lovely host today, Irene Latham, at her blog Live Your Poem. Inspiring words fill the pages of those who join in. Like Slices of Life, but poetry adds a different flavor to the 'story'. 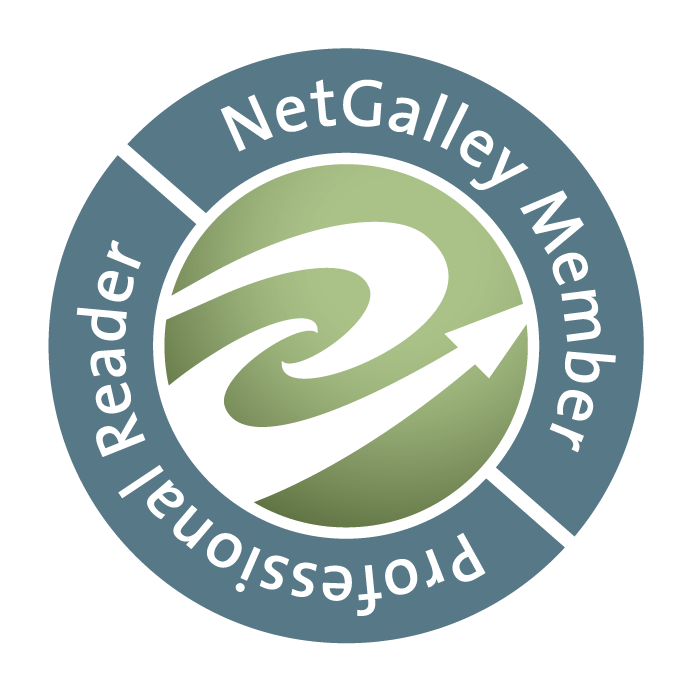 This week Irene has celebrated a new book out this week, Fresh Delicious - Poems From The Farmer's Market, and shares still another new one about gathering poetry. Many of you know I've started working at a used book store, purely volunteer, as are all who work at this special store. I do love doing this, and have tried very hard NOT to bring home a book every week. But there are times that I just cannot leave a book lonely on the shelf. Look what I found today! I started reading it, and know it's going to be pure pleasure. My heart is piercèd through. And among other beautiful ones, and allowing White's words to entertain me, I found a poem that feels spring-like. It's a love letter to his wife, contains a spider and makes a sweet connection. You'll see. In his poem Locksley Hall, Alfred, Lord Tennyson tells "In the Spring a young man's fancy lightly turns to thoughts of love." Evidently, so did E.B. White's fancy. The remaining words are HERE, The poem's title is different in various places. I read The Story of Charlotte's Web a few years ago, a wonderful book, and in my search for this poem, I discovered that it is in this book too, with its story. E.B. White sent this poem to his wife in 1929, only three weeks after their marriage. He had grown up studying all sorts of creatures, and the text says, "Finally, he wrote a poem to her that united his close-up observation of nature and his growing sense that their marriage was the right antidote to his rootlessness." Charlotte's Web was published in 1952. Spring and spiders are on their way. What a delightful poem to share with us! Brought back memories of sitting on the cottage porch and watching a spider spin a web. Which we'll soon be doing, right? Thanks, Loralee. Loved this post! I was hooked as soon as I saw the title. I'm in the midst of reading Charlotte's Web to my first grade class. They're spellbound and so am I. It was fun to see a bit more of the man behind the story. "Earth is a hoyden"--love that! That poem is just lovely, so I hope you'll be able to find all of it, Molly. Reading Charlotte's Web aloud is a gift to your students! Thanks. I just used Charlotte's Web in a lesson on opening lines with my fourth grade classes. They immediately knew the book (not the point of the lesson, but heartwarming nonetheless). 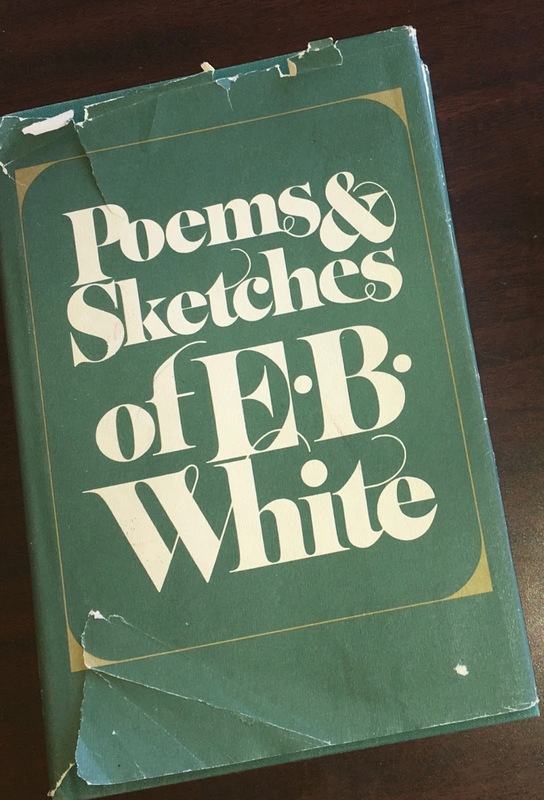 Now I feel the need to revisit EB White, too! That is great that they knew the words, Chris. A treasure! Thanks for telling me. Oh the poem of the spider reminds me of the late summer/early fall in the Midwest. If you sit for a moment, you can almost certainly catch a spider spinning a web. What a beautiful image. Glad you enjoyed it, Kendra. That spider poem would make an excellent epigraph to the Robert Fulghum vignette, "The Lady and the Spider." Thanks for sharing. I don't know that Fulghum piece, will see if I can find it. Thanks, Brian. You're welcome, Irene. It is lovely, isn't it? "Charlotte's Web" is one of my most favorite books of all time! Who would think that some farm animals and a spider could make me laugh and cry. I love, love, love, his thoughts on his wife and marriage . . .right antidote to his rootlessness is beautiful! Great slice Linda! Thanks, Lynn, happy to bring more E.B. White love to you. I could see why you brought this one home, Linda - so many connections to that one of a kind book. His voice pleases me every time I read it, Tara. The book is filled with little essays, poems and sketches. I love it already! Thanks! Lucky wife! Thanks for sharing these gems with us, Linda. You're welcome, Tabatha, It's a beautiful discovery. "The green girl, spring, has found her voice,"...I love the image and the rhythm in that line! Thank you so much for sharing the other E.B. White poem. Who would have thought spiders could conjure and communicate thoughts of love? ...p.s. I love the Spring look on your PF logo. Thank you! You're welcome, CB, & I'm glad you enjoyed all the parts of my post today. I have that White book on my book shelf. Thanks for getting me to look at it again. How great that is, Joy. I am loving it! I just loved "The green girl, spring, has found her voice"! You just must be going crazy in a bookstore! The poem is wonderful, so hope you can find it, perhaps at the library? I have to browse at the store so I can learn what's on the shelves to help customers, but try hard not to get too many as I said. There are lots of good ones! This one had to come home, though. You have presented this collection so beautifully, Linda. You are the perfect patron & volunteer of your special store to rescue it for your home. I'm having a hard time reading posts today, Jan, want to just sit and read this book. Now I'll look for "A Listener's Guide" for sure. Thanks. Finding treasures in a bookstore. I fully understand that you want to sit and read and read and read. Savor the reading. I am sure you'll find inspiration there. Thanks, Terje, I think I will, too. Interesting that strands of spider love spin through EB White's life. I can't wait for Melissa Sweet's biography of him (due out this fall). The book you found - what fun! I love this line from the pigeon poem: "Earth is a hoyden, loud rejoice:" Thanks, Linda, for these poems, both new for me. I know that we will love that book, Ramona. Glad you enjoyed the poems. That book was waiting for you. It needed you. Thanks for sharing E.B. White's poetry. I love the idea of the spider and the string to lead one back to home. Isn't it delightful. I'm looking forward to seeing what other things I'll find. Thanks, Margaret. I love the idea of a man who is secure enough in his wife's love that he can include a spider in a love letter to her! Well, he was young after all, but from the little I've read so far, he wrote a lot of poems to her. Thanks, Diane. This poem was included at an exhibit of Garth Williams's illustrations of Charlotte's Web at the Eric Carle Museum of Picture Book Art. I was overwhelmed by its beauty and simplicity. We were on the same wavelength today, Linda! I wish that I could visit the Eric Carle Museum someday. It must be wonderful, Catherine. Thanks for telling me. That's awesome. Yay for spring! What neat tidbits you discover, Linda! Thanks, Jennifer, glad you enjoyed them. I can just imagine the amazing books that you must come across at the store. I am so surprised that I never connected Charlotte's Web and EB White's poetry... same person!? Ahhh... how did I miss that?! Such great poems to share. Thanks for the spring feeling and thoughts! Yes, it is the same person, Ana. Charlotte's Web is so well known that I suppose many don't know of all the other things he wrote. You're welcome. Glad you enjoyed them. Happy you enjoyed the poem, Jama. I am loving being at the bookstore, truly a lovely move from teaching. It is the work of someone who loves spiders, isn't it? Thanks, Mary Lee. Hmmm. I want to visit this store. It seems magical. Who could not take that book home. What a gem! White never ceases to amaze me. He seems to exemplify the intertwining of nature and words. Thanks for all, Julieanne. The store has so many books, always a new adventure when I'm there. I'm glad you like the poem. I think it's so clever. How funny to think of spiders as romantic. Isn't it female spiders that sometimes eat the males? Ah, no matter. The poem caught me in its web. I'm not sure all female spiders do that, but some. Love your last line, Michelle.